Choosing a good bird cage for a parrot starts with understanding what cage size is best for your bird, but it doesn't end there. 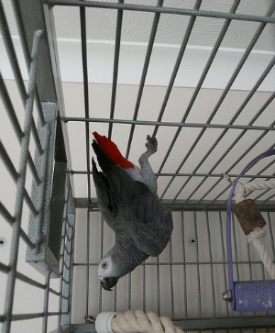 Below are some frequently asked questions about picking the best parrot cage. What's the right size for a bird cage? The appropriate size for your bird's cage depends on the size of your bird, how active that type of bird is, and how much out-of-cage time s/he will get. A bird cage, at minimum, needs to allow your bird to flap his wings fully, even amid a wide assortment of perches and toys. The more active your species, the more room there should be to move, but don't assume that a "perch potato" doesn't want more room. Most bird owners find that birds will become more active when given more room to play. Remember, in the wild a parrot will expand tremendous energy flying around looking for food; in a domestic environment we need to give our companion birds the opportunity to move around and get exercise as well. Learn what size cage to get for your bird. What style or type of bird cage is best? With so many different types of high-quality cages to choose from, it can be overwhelming to narrow down your choices. For example, would your parrot prefer a domet op cage, aplaytop cage, a square cage, a corner cage, an octogonal cage? Much of it comes down to your personal preference. Square, flight-cage style cages tend to be the best value for the available internal space, but some people prefer the design of a dometop cage. For those with limited space to house a cage, a playtop cage -- which combines cage and play gym -- can be a space-saving alternative to needing a separate playstand. However, some types of parrots are prone to becoming cage aggressive. If you have a bird who jealously guards his cage and bites when you come near, you and your parrot might benefit from having a separate play area away from his cage to dampen that protective "nest guarding" instinct. What material should the bird cage be made of? And what about bird cage materials? There are stainless steel cages, powder-coated cages and other materials as well. Stainless steel cages are the highest quality cages, but also the most expensive. Powder-coated cages are the most popular material for bird cages and come in a wide variety of shapes and sizes. Avoid cages with flimsy plastic coating, as most birds will chew right through the plastic coating before too long. It goes without saying that cages made of decorative materials should be avoided as they can pose a health hazard to an animal which is known for chewing everything it can get its beak on. Many birds have died from heavy metal toxicity, so only allow your parrot to live in a cage made of bird-safe material. Cage types to avoid would be cages that are too small, cages whose bars are too flimsy to hold up to your bird's beak, round cages, or cages that are rusted. Avoid having to replace a cheaply made cage and spending more over the lifetime of your bird (or poisoning your parrot) by looking for cages with welded bars, rather than ones with holes that the bars are slotted into, or other "nooks and crannies". Not only are these spaces prone to getting rusty, but they also collect food and droppings that are a breeding ground for germs. When considering a used bird cage, try to see the cage in person before buying if possible. Otherwise insist on seeing close-up photos of where the joints come together to make sure there are no rusted areas. 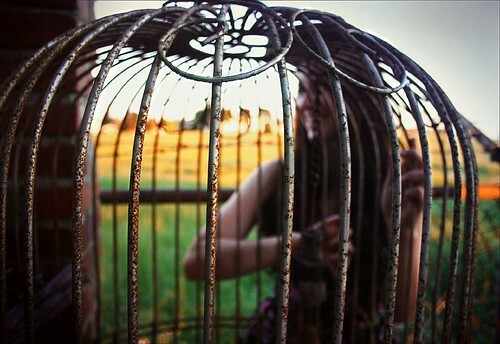 Once a cage is rusted, it is extremely difficult to properly remove the rust. Round cages (the tall cylindrical cages) are also not a good idea. Parrots like the security of corners, and round cages do not allow a bird to feel secure. Round bird cages also tend to be much taller than they are wide, which means the parrot doesn't have enough room to move around -- birds tend to fly and jump horizontally, never straight up. Since most birds don't like hanging out at the bottom of the cage (and perches at the bottom of the cage get pooped on), most of the height is wasted and the bird has very little usable space in these tall but narrow cages. Round cages tend to be interesting to look at but not very functional. Certainly, your parrot would prefer a BIG cage unless he is out most of the day or has the freedom of a bird-safe room where he gets to be out all day. Browse Discount Parrot Supplies for good deals on new and used bird cages and to see examples of bird cage setups. I think most people when they are looking for bird cages or any other pet enclosure they are just looking for the cheapest one but they could end up costing you more in the end. The cage could be made of bad material that could result in you having to buy a new one. You also want to make sure you know what the cage is built of because it could ultimately poison your bird. You also want to think what it will take to clean the cage.